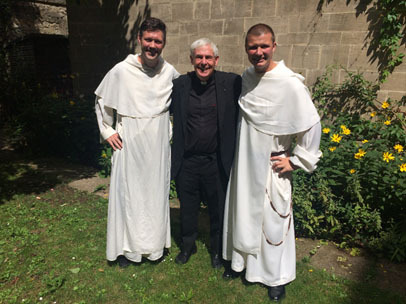 On Sunday July 30th (the day before the feast of St Ignatius, of course), two OS, Sam Burke OS 04 OP and Toby Lees OS 99 OP were ordained as deacons in the Dominican Order, along with another of their brothers and two Franciscans, at Blackfriars in Oxford. Among others of the Stonyhurst connection who were glimpsed there were Lord David Alton and his wife Lizzie , John Cowdall Chairman of Governors, and his wife, Eileen, Jeremy Noseda OS 82, David Hurst OS 70 and Fr Nick King SJ OS 66. Frs Sam and Toby both now go to Rome to the Dominican College to continue their studies as Dominicans.